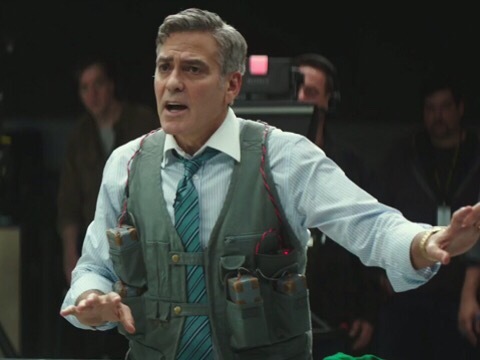 The film stars George Clooney as Lee Gates, a TV personality who advises his audience on commerce and Wall Street, and who is forcefully interrogated by Kyle Budwell (Jack O’Connell), a grief-stricken bankrupt viewer who lost his money after a previous tip. I chose to go to this movie in this way: “Eeny meeny miny… Oh, Money Monster has a much shorter running time than X-Men: Apocalypse or The Nice Guys so let’s just watch that one”. Money Monster is a decent enough film but it’s one of those that you know most people won’t bother to make a trip to the cinema to see. It’s a home-watcher. I enjoyed it even though it’s a bit formulaic & predictable but, hell, most movies are. If you like any of its stars or want to see a Jodie Foster film (I thought she’d directed far more movies than she actually has! ), you’d probably like this one just fine. This movie (its basic plot, at least) reminded me a lot of Man On A Ledge & I did keep thinking of that movie thoughout this one. I remember really looking forward to that film as it had a great concept but it ended up being a stupid, silly mess. 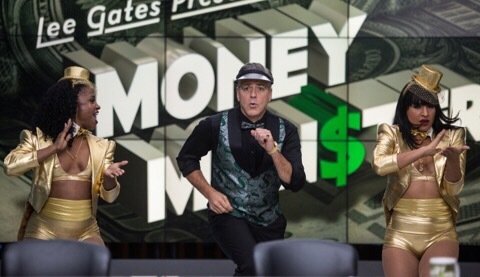 Luckily, Money Monster is much better than Man On A Ledge so don’t worry about my comparison! It has much better writing & acting plus situations that aren’t as ridiculously far fetched. Unfortunately, it does fall apart at the end after a pretty promising start. It’s one of those films where the “surprise” of what’s “really going on” isn’t a surprise in the slightest, which was a little disappointing as I wanted it to be something more than just “Oh, that’s it? Well that was obvious from the start”. I think it also fails to get its message across (if it even has a message?). I suppose the message of sorts is just about how big business/money always screws over the little guy but we all know that’s a fact of life anyway. This movie could’ve provided a good commentary on that but instead just turns into a pretty straightforward good guy vs bad guy hostage drama. I’d have to say that at least The Big Short made this same sort of point in a much more effective way & had a message (I actually hated that movie, though. Snoozefest!). 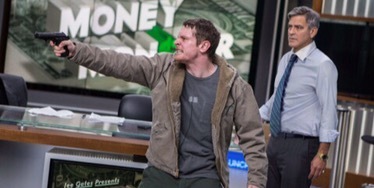 Money Monster takes the path of “entertaining movie” more than “thought-provoking drama”. But there’s of course nothing wrong with a movie being entertaining – I just wish Money Monster had dug a bit deeper to be a little something more. A quick mention of the film’s stars: Clooney’s role has his name written ALL over it – I would imagine he was the exact person they had in mind for the role even as it was being written. So, yeah, that works but his performance can’t help but feel a bit phoned-in because of it. I’d have to say that Julia Roberts actually does a better job here (and that’s being said by someone who really isn’t one of her fans). This is the perfect sort of role for her these days, though, and I’d even possibly go so far as to say she’s the best one in this. I know there’s been a lot of positive buzz around Jack O’Connell after Starred Up & ’71 (both of which I’ve not seen) and he’s decent enough in this but I think that his character lets him down as the movie fails to make him as sympathetic as I think it had intended. Dominic West, Giancarlo Esposito & especially Caitriona Balfe all did a good job and some of the smaller characters were pretty well-written and provided tiny bits of comic relief, even down to the cameraman who has to stay to film the whole thing while George Clooney has a bomb strapped to him. 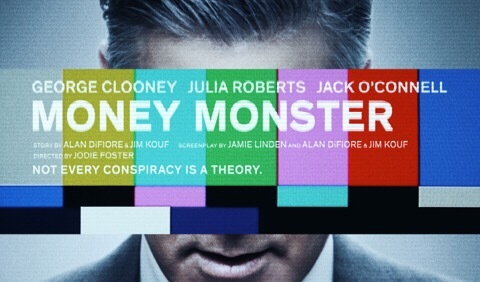 I’d recommend Money Monster to anyone who thinks they’d enjoy it. As long as you don’t expect anything too deep, you’ll probably like it okay. I think it has slipped under the radar, which is kind of a shame as there aren’t a whole lot of similar films currently being made. I think Jodie Foster did a decent job with this one & should do more directing. great review! do u think i’d like it? I knew that Clooney and Roberts were going a movie together but I didn’t hear of it being released already. I thought I might have seen a trailer that looked interesting but I think you just talked me out of bothering with it. I might watch this… one day. Lol. Hehe. It’s one that can wait for “one day”. ; ) It’s decent enough but no need to rush to see it! LOVE that Miss Mutant!! I so would have chosen the shorter duration too lol. I’m quite looking forward to seeing this (eventually) I daresay it won’t be a favourite but I think the premise I’ll enjoy enough for at least a one time watch.